Leslie traded her gun for the Nikon yesterday and caught a remarkable sequence on a chukar bust. She actually busted two birds behind me, and Angus went after the lead bird. The bird in the photos is the second bird. When I look at Angus in the third photo, it’s hard to reconcile the fact that he’s almost 12 years old with what I’m looking at. It makes me happy. Click on the photos to make them big. It was a gorgeous day to be out. Here are some other shots Leslie nabbed. I got nothing. Except joy from seeing so many birds and tracks and happy dogs. And from being able to hike sort of like normal. What beautiful clarity and color! And people! And dogs! And birds! Where’s the pear tree? The cold comes through. Brrrr. Great pictures Leslie. You go Angus. 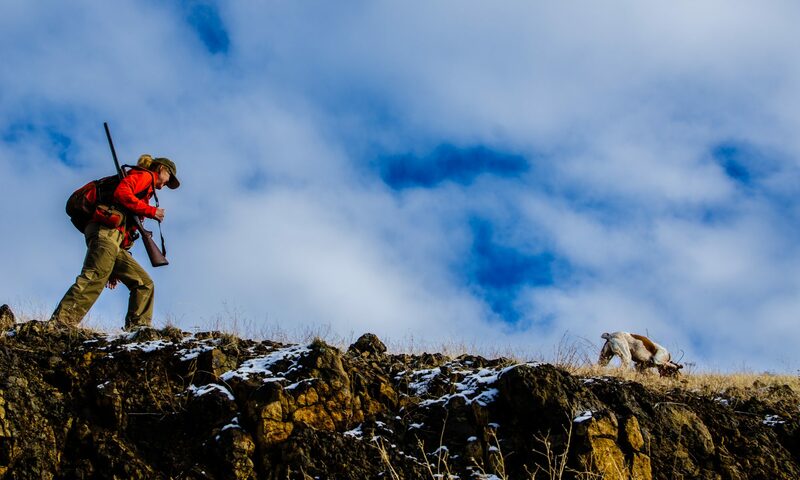 Glad to see you found chukars on easy ground that’s better for your back. Stay off the steep stuff!! Merry Christmas. Thanks, Cliff. Yeah, we like that spot, but it was my first taste of serious wild-busting. Lots of people hitting that spot now. Bummer. Great pics and good to see you are doing better. The Mearns hunt is going good. Hannah is slowing down and Susie remains a ball of fire. Merry Christmas and Happy new year to you and Leslie. I’ll be moving on to Texas later this week. Thanks, Sam. We woke up to several inches of wet snow this morning. Looks like a white Christmas. We’re still getting out, though. I’m going to try to hold off back surgery until after the season ends. We’ve seen chukar in some pretty interesting places… Have fun in Texas! And happy holidays! Nice pics! Seems like a lot of sagebrush where you flushed them. Do you regularly find birds in sagebrush? In Cali/Nevada area I don’t find them there— only cheatgrass slopes or rockstack cliffs.